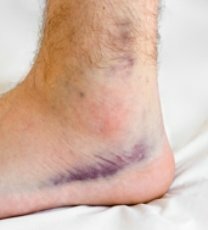 There are many different reasons behind unexplained bruising in adults, including the most common one which is physical contact against a hard surface that is hard enough to cause a bruise, but contact the person does not recall having happened. This type of bruising is especially common in contact sports, where the intensity of the action can be such that physical contact, as hard as it may be, often goes virtually unnoticed. It’s only later that the bruises caused by the activity first become noticeable. In most places on our body there is a certain amount of soft tissue just under the skin. When this tissue experiences trauma, such as that due to a bump or a blow to the skin with a hard object, tiny blood vessels in these tissues can be ruptured. Blood will then flow from the broken blood vessels and accumulate or pool under the skin. The accumulation of blood is then seen as a dark-colored patch, in other words, as a bruise. Physical exertion can also cause bruising, even though physical contact through the skin may not have occurred. Here again, it’s usually athletes or body builders who are most likely to experience these bruises. When a muscle is being exercised strenuously, it’s not uncommon for blood vessels in a muscle fiber to rupture, and if the location where this occurs is just under the skin, a bruise may be observed. Whenever we exercise our muscles, microscopic tears happen, but these are usually so small that any blood loss is minute, and whatever blood may be lost isn’t necessarily near the skin. Aging can also be a factor. As we get older, the walls of our blood vessels tend to become a bit thinner and weaker. Also as we get older, we normally begin to rid ourselves of fatty tissue. Consequently, we lose some of our protective “padding”. The combination of weaker blood vessel walls and the loss of this protective padding, means the elderly are very much more susceptible to bruising, or at least tend to bruise more easily. The bruises can occur anywhere, but in many if not most cases happen on the backs of the hands, or on the shins. Diseases and disorders can also make one bruise more easily, and often without knowing how the bruise occurred. While there are a number of different blood diseases, any disease which affects the blood’s ability to clot or coagulate properly can lead to bruising, even in cases where contact has been minimal. If we hit the back of our hand against something hard enough to feel it, some soft tissue may be damaged, but the amount of blood lost may be too minute to cause a bruise. If someone with leukemia for example, hits their hand with the exact same force, that person may experience significant bruising, since more blood will have escaped from the damaged blood vessels before clotting is able to occur. Children can get bruises in much the same way as can adults. It can truly be said that bruises have no respect for age. Children engaged in playtime activities often come home with a bump or bruise or two, and in many cases don’t remember how the bruise occurred. All they remember is that they were having a good time. Toddlers are very prone to bruising. It’s not because of their physiological makeup, but mainly because, as they are learning to walk, they bump into things and fall down quite often. When toddlers are just learning to walk they tend to lead with their head. The number of toddlers who have never suffered a few bruises on their head or under their chin could probably be counted on the fingers of one hand. As is the case with adults, some unexplained bruises in children are the result of a disease of a disorder. Leukemia is one cause, and skin disorders are another. One cause of bruising that affects children, and sometimes affects the elderly as well, but seldom affects those in between, is a vitamin or mineral deficiency. A lack of vitamins C or K can lead to easy bruising, as can an iron deficiency. Another cause of unexplained bruising in children, although the children themselves often know where the bruises have come from, is child abuse. Children who are being abused, and have the bruises to show for it, will normally have those bruises on their head or their face, more so than on other parts of the body. Some children however just seem to be a bit more accident prone than others, occasionally making their parents afraid to take them out into the public, out of fear that onlookers will be convinced the child has been or is being abused. The only time unexplained bruises should be a cause for concern is if they have not happened frequently in the past but are doing so now. That could indicate an underlying disease of disorder is in part to blame. It would therefore be advisable to see a physician to see if there is something amiss that requires treatment.